Iconic, multi award-winning EVE LOM cleanser delivers five benefits in one product: cleanses, decongests, tones, exfoliates and removes even the most stubborn and waterproof makeup. Remarkable. Multipurpose. Multi-award-winning. The original balm cleanser. The EVE LOM Cleanser was described by Vogue as 'probably the best cleanser in the world' and is the foundation of the skincare regime. It changed the face of cleansing and continues to be expertly balanced for all skin types, skin concerns, and environmental conditionsaround the world. With its signature blend of four aromatic plant oils, specially woven 100% cotton Muslin Cloth and quick routine, the result is incredibly glowing, radiant skin with a smoother, more refined texture. The difference can be seen instantly and just keeps on improving with use. 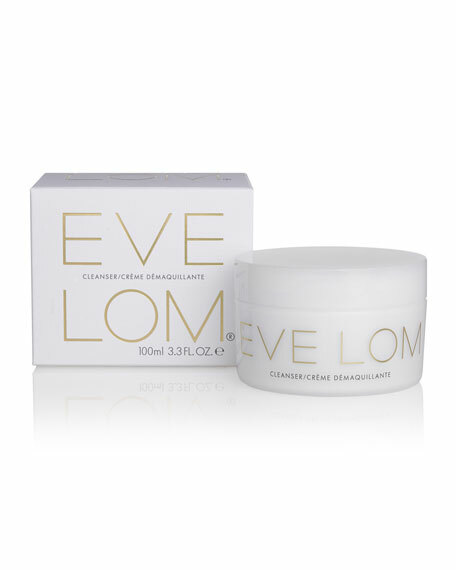 EVE LOM Cleanser, 100ml/3.38 fl. oz. 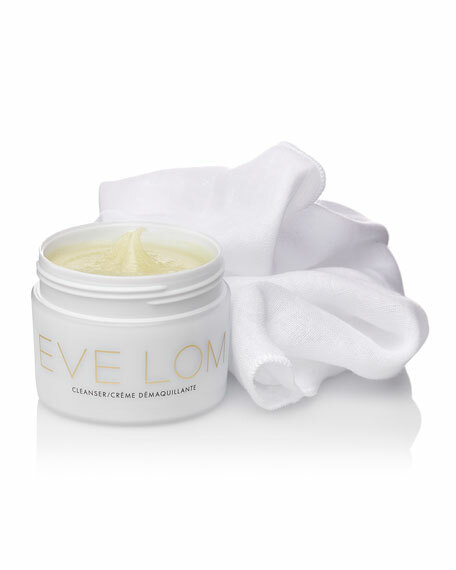 Every EVE LOM Cleanser comes complete with a complimentary Muslin Cloth. The EVE LOM Muslin Cloth has been specially created to work with the Cleanser to gently exfoliate and encourage blood circulation leaving the skin feeling exceptionally smooth and radiant. Cloths should be washed at 40°C/104°F after every 2-3 uses. Finally, rinse the cloth in cool water and hold over the face and neck. This helps close the pores, giving the skin a more even, toned appearance. It also leaves the skin feeling fresh and ultra clean. At EVE LOM beauty starts with the right technique. By combining the brand's supreme cleansers with their signature facial massage designed for lymphatic drainage, your skin is awakened and revived to reveal your best self. Utilizing EVE LOM products to cleanse and exfoliate your skin creates the ideal base for your beauty products to perform at their highest level. A cult favorite for over 25 years, the EVE LOM brand proves that luminous, youthful radiance can be yours. EVE LOM Cleanser, 200ml/6.76 fl. oz.